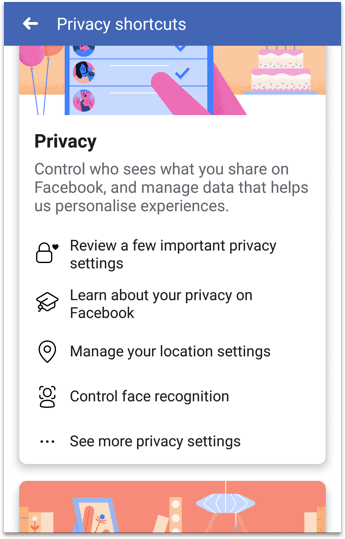 NOTE: Facebook is a “free” app, but even though you don’t have to pay for it with money, your likes, comments, private messages and even the content of your photos are all recorded so that Facebook can better advertise to you. The first place to start is the privacy check-up, which gives you a quick look at the main privacy settings. 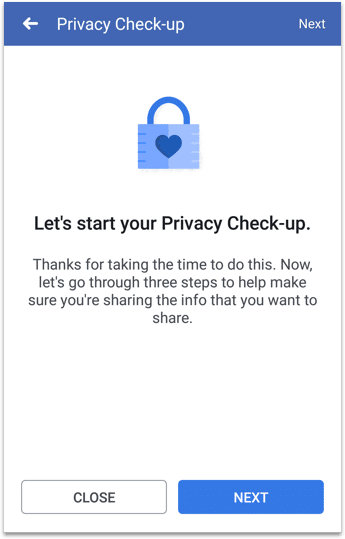 To start the check-up open your profile page, tap on the 3 dots, then on Privacy shortcuts, scroll down to the privacy section and tap on Review a few important privacy settings. 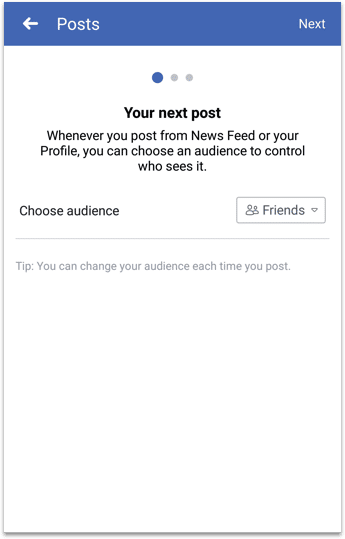 Continuing the privacy checkup, select Friends when asked who is able to see your posts. That means that the posts won’t be public to everyone on Facebook, they can only be seen by your friends. Next choose who can see your profile information, which can include email address, phone number, schools and other personal information. Here you can choose Friends again so it’s not publicly available. 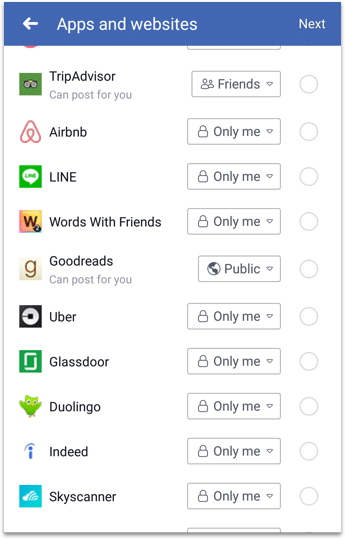 Select which apps are able to post to your child’s profile, for most apps you want to choose Only me and make sure they’re not Public. Also, delete any apps on there that you don’t recognise. Anyone can you send your child Facebook friend requests, to restrict that so it’s only Friends of Friends open the child’s profile page, tap on the 3 dots, scroll down to the Privacy section, select See more privacy settings and tap on Who can send you friend requests, select Friends of Friends. 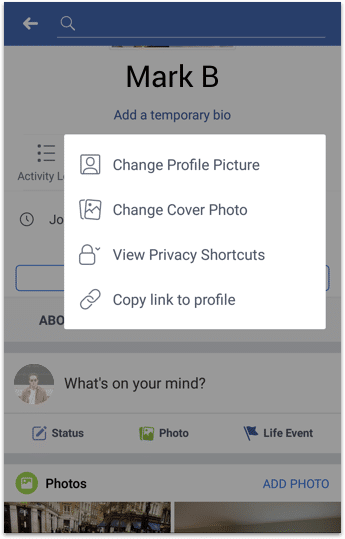 If someone is bothering your child on Facebook and you want to block them, tap on the main menu button, then on Settings, on Blocking and from there you can add people to the blocked list. As a parent, there may be times when you want to see when a comment was made or a photo added to Facebook. You can do this from the Activity log, open the child’s profile page, tap on the 3 dots, select Privacy shortcuts, scroll down to the Privacy section and then select Activity Log. You can also delete specific posts from this section. Lastly, anyone should have control over their data and how it’s used. 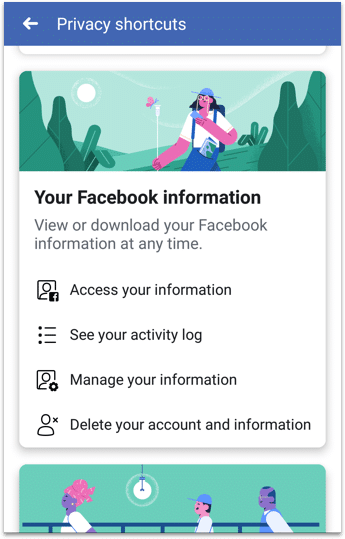 Facebook gives you gives you the option to delete your account and information (you can download all your information first if you want to save it), you can do that by going to Privacy shortcuts and tapping on Delete your account and information.